Horizons are exported to text files. The file structure depends the selected format, but in general each row of the text file corresponds to a point on the horizon. 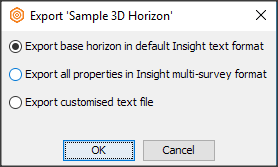 By default, Insight will save horizons in the 120hors sub-folder. 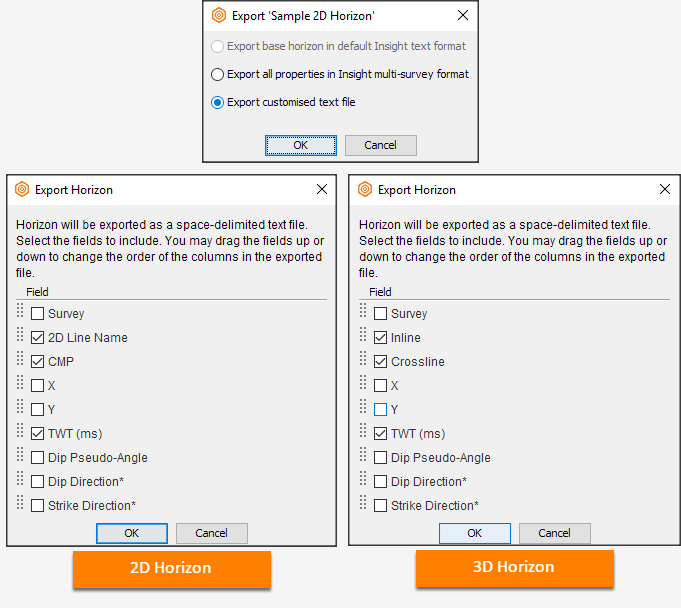 Note: For more information on exporting horizon files, see Horizon Export File Formats. Base horizon: a text file containing rows of location and time or depth for a single 2D or 3D survey, or X/Y. It does not include additional properties. Complete horizon: (All properties, multi-survey) a complete horizon containing location, time (or depth), and any additional custom properties, for one or more 2D and 3D surveys. Customised horizon: a text file containing rows of location, time, depth, and custom properties, selected by the user. In the Control Panel, open the Horizon tab. 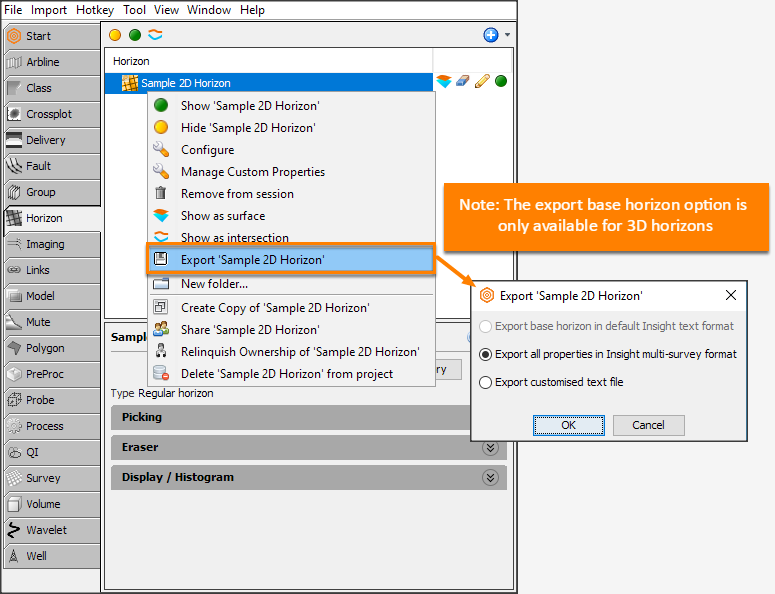 Right-click on the 2D or 3D horizon to export and click Export 'Horizon'. The Export 'Horizon' window will be displayed. The option for Export all properties in Insight multi-survey format will be selected by default. Click OK. Type the file name to save as .ilclt (time-domain) or .ilclz (depth domain) format. 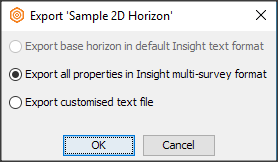 Tip: If the horizon extends to multiple surveys, select Export all properties in Insight multi-survey format. Select Export all properties in Insight multi-survey format. Type the file name to save in .dugmsh format. Select Export customised text file. The Export Horizon window will appear. Tick the checkbox of the field to be exported. To change the order of the fields, click and drag the dotted area to the left of the field name. Type the file name to save in .dat format.